Chef Jabari Wadlington excels at updating traditional fare. Steps from The University of Virginia’s iconic Rotunda, Farm Bell Kitchen at the Dinsmore Inn offers reinvented Southern classics in a relaxed setting with a historic past. The barely year-old restaurant, on Charlottesville’s bustling Main St., has already become a favorite among locals and university students, and a dining destination for out-of-towners. Owner Ryan Hubbard’s wonderfully executed vision of hospitality and chef Jabari Wadlington’s distinct culinary style culminate in a dining experience that is not to be missed. Entering the Dinsmore Inn feels like stepping back in time. Though the decor is updated and sleek, and Farm Bell Kitchen’s coffee bar still has that new-equipment sheen, the architectural details reflect the house’s true age. The Federal-style townhouse was built in the early 19th century by one of the era’s great artisans, James Dinsmore. Dinsmore was Thomas Jefferson’s preferred master carpenter. His projects include some of Virginia’s most-loved historic sites, including Monticello, Montpelier, and the Rotunda. Like these now-famous landmarks, the Dinsmore Inn has a similar Old-Virginia aesthetic. Dinsmore even used the same type of bricks that were used to form the Rotunda. Inside, the restaurant’s high ceilings and wood floors are bathed in light, courtesy of the enormous original windows that line the front wall. At the back of the room, an elegant Colonial fireplace and intricately designed lead glass doors—which Hubbard restored—hint at the building’s past. The restaurant’s name comes from a bygone era, too. Farm Bell Kitchen is named after the clanging bells rung daily at 19th-century farms to beckon hands home for supper. The bell of Farm Bell Kitchen stands just outside the front patio. Salvaged and refurbished by Hubbard, the bell speaks to his desire for guests to feel as welcome as if they were dining at home. 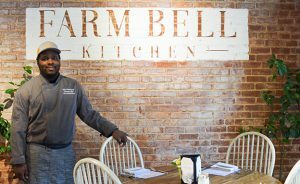 He continues, “All of the intention around what we did here was to make it feel comfortable.” Farm Bell certainly accomplishes that goal. On a weekday afternoon, college students can be seen studying, even smiling, sustained by snacks from the coffee bar. A table over, business partners pass proposals in between bites of brunch. By the window, a visiting couple enjoys lunch as they plan a day of sightseeing. Though the dining room atmosphere is decidedly casual, chef Jabari Wadlington’s food is thoughtfully elevated and an expression of his culinary journey. A Johnson and Wales graduate and Goodstone Inn alumnus, Wadlington started honing his skills from a young age, learning from his grandmother and the cookbooks she bought him. He switched his degree from aeronautical engineering to hospitality. As part of his training, he interned with Tom Wolfe in New Orleans, and later worked with Christopher Carey and Tarver King at the Goodstone Inn in Middleburg. Wadlington’s food is a perfect balance of his home-cooking roots and professional fine-dining experience. For brunch, French toast is reminiscent of mom or dad’s, lovingly made and piled high. However, the Farm Bell Kitchen chef ups the ante with a Bananas Foster version. 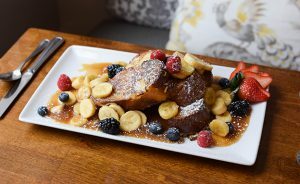 The thick-cut house-made brioche is covered in fresh fruit and dripping with a sweet caramel sauce. The bread is delightfully crisp on the outside and pillow-soft on the inside. While any restaurant that opens before noon has avocado toast on the menu, at Farm Bell Kitchen this food trend is given an interesting spin. Wadlington splits his avocado and bakes two farm fresh eggs in each cavity. He plates it with a crunchy toasted baguette, which, by design, is the ideal vehicle for runny egg yolks and the side of tomato chutney. Farm Bell Kitchen’s supper menu is a collection of Southern favorites with a few surprises, too. 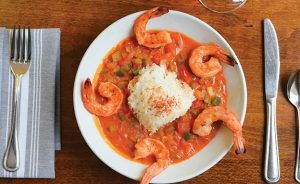 Carolina Shrimp Creole screams Southern cuisine with okra, the Cajun holy trinity—bell peppers, onions, and celery—and juicy Wanchese-region shrimp. It is all served in a spicy tomato broth over a mound of jasmine rice. Grandma’s meatloaf is given a facelift and made from bison. 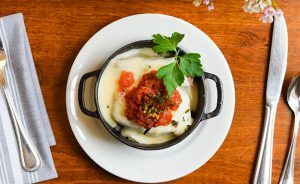 The tender loaf is served with potato gratin and smothered in cheese fondue. The richness of the fondue is cut by the slightly acidic tomato ragout. Thyme gremolata adds a hint of freshness. The dinner menu, which is broken into three courses, includes a selection of smaller but equally enticing plates. 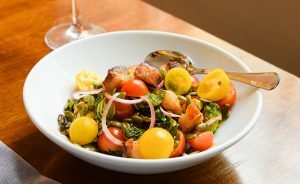 Warm Brussels sprouts are loaded with pork belly, heirloom tomatoes, and toasted pumpkin seeds. Here again, Wadlington pairs rich with fresh. The tomatoes are a clever contrast to the succulent pork belly while pumpkin seeds add a delicate nuttiness and irresistible crunch. With the support of the community, a unique historic backdrop, Wadlington’s refined food, and Hubbard’s unfailing hospitality, the team at Farm Bell Kitchen may be closer than it realizes to making those big words a well-deserved reality.